I took a shower and put clean pajamas on. It's just one of those days to laze around. I have been cleaning and doing laundry. But I've also been watching some baseball games (Tampa Bay lost and the Braves are losing unfortunately). 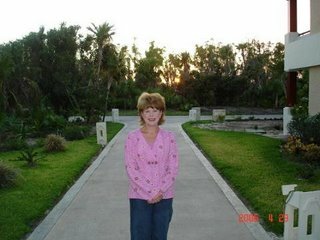 I've also been reading my blogs. 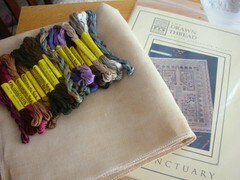 I saw that Andrea has started Drawn Thread's Sanctuary. Her stitching is so neat and pretty. She is really an inspiration to me! It made me remember that I've had Sanctuary kitted forever! 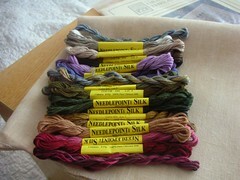 So I got it out and pulled the silks and linen and took their picture because they are so pretty! 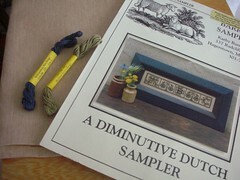 It's Barrick Samplers (now Carriage House Samplings) "A Diminutive Dutch Sampler." I'm missing one silk, which I'll probably get tomorrow. 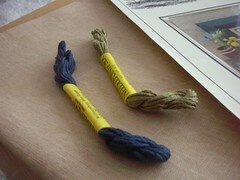 The fabric is the 40 ct. R&R I got from Handcrafts Online. 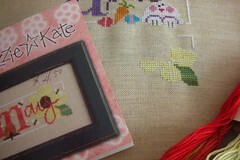 It's so funny because Niky just posted her finished sampler today. What a coincidence! I did stitch a little while I was there. I thought I would work on "A Bit of May." May is one of my favorites out of all the months. I love the color combinations. Well, not much else going on here. Bradley is finally over the stomach bug he had. He was able to eat normal food today. I'm still hoping no one else gets it!! Thank you everyone for all your nice comments, they really mean a lot! :) Write later! Hi,I'm niky, you just visited my blog so I came in your.It's really funny that you're doing the same project of mine(Carriagehousesamplings pillow)you'll really enjoy in sttihcong it. I admired all of your beautifull works. Congratulations. Niky. Love the pictures. The little LK May piece is so cute. Aren't pajama days the greatest :-). I do those too. HeHeHe! It's good to have things ready to go!